No matter how high-tech we get, the home calendar is still a must. It becomes the family communication center. Everyone checks the calendar to see who has an appointment, whose birthday is coming up and when the next Pens home game is. 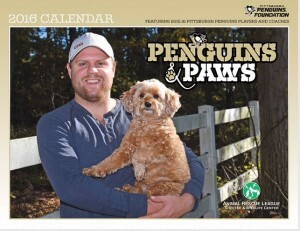 The only calendar you’ll need, The Penguins and Paws Calendar from Animal Rescue League of Western Pa, is back. The calendar is the way to stay organized and show your Pens pride at the same time. It features your favorite Pittsburgh Penguins® players with some of our area’s homeless pets. The best part of purchasing a Penguins and Paws Calendar is that all proceeds benefit the animals at Animal Rescue Shelter & Wildlife Center. It really is the perfect gift for so many people on your list. Students from grade school thru high school and on to college love them. Do you know someone who has moved from the area? They’ll feel like they never left “dahntahn” when you gift them a Penguins and Paws calendar. Don’t forget to order one for yourself! !